I depict people, their noble characters, their rich inner world and their graceful bearing, because people are the motivational force of history. Li first studied art in 1947 at the National Peking Art College. Having experienced a time of turmoil, he studied in the special classes for cadres at the Central Academy of Fine Arts in Beijing between 1949 and 1951. In 1951 he was appointed art designer in Chongqing for the Xinhua Daily. 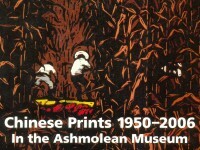 Following the establishment of the Sichuan Artists’ Association in 1953, Li worked as a full-time printmaker for four decades. He has used various woodcut techniques to portray the lives of Tibetan people; his observation of character is perceptive and there is often an underlying social comment to be found in his work. 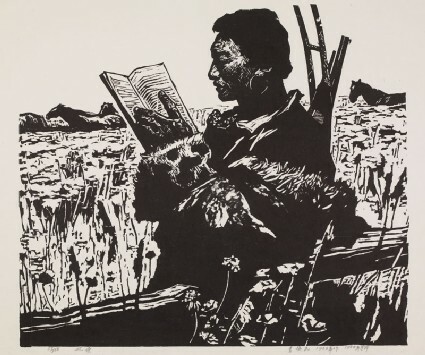 This print depicts a Tibetan shepherd reading a book, implying that under Communist rule, Tibetan shepherds, who used to be slaves, have become literate. Li worked as a full-time printmaker in the Sichuan Artists’ Association for four decades, and is one of the leading representatives of the Sichuan School of printmaking. He has used various woodcut techniques to portray the lives of Tibetan people and an underlying social comment is often found in his work.